When Nekron unleashed his Black Lanterns upon humanity and its superheroes, the various Power Ring Corps joined forces, sending out rings to new human champions. The Blue Lantern Corps, wielders of the Blue Light of Hope, chose Barry Allen - a man who never gives up. As Blue Lantern The Flash, he joined the battle against the Black Lanterns with an unshakable belief that "all will be well." Gah! We've already talked about how stupid "Blue Lantern The Flash" is as a name - he's just "Blue Lantern Flash." And while we're at it, let's be clear about something: "a man who never gives up" isn't demonstrating "hope," he's demonstrating "will." Let's get our stupid pretend emotional spectrum right, shall we? Blue Lantern Flash is a perfect example of why we're reviewing DCUC17 here on the blog instead of doing "real" reviews: he's just not worth our time (or yours - it's not like we're not any more important than you are). The figure is a repaint of the DCUC7 Flash figure, with new hands; one sculpted with the Blue Lantern ring, the other open to hold the included power battery (which he shouldn't have in the first place, as you know). At least Mattel managed to get the symbol on his chest to line up completely - that's more than DCD managed, isn't it? The wings on his boots and over his ears got warped by their time in the package, but they're super-soft pvc, so they'll bend back. It's a bit distracting that the manufacturing info is tampographed in white paint on the inside of his left foot, but you could probably scrape that off. 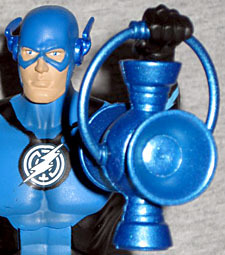 Blue The Lantern Flash comes with the left arm of the Series 17 BAF, Anti-Monitor. The shoulder and gauntlet are connected by a thick golden tube, and the arm itself is turned around backward to fit into the slot in the tray. That's a little bit weird, isn't it? The original DCUC7 Flash wasn't a very worthwhile figure: for one thing, it's Barry, and nobody but Geoff Johns cares about him; and secondly, the body used was too big and bulky. In fact, that Flash remains the only one of only two DCUC figures I've never bothered to get. This one improves things a little, by virtue of a more interesting costume, but the only real advantage it has over DC Direct's version is the articulation. This entry was posted in blog exclusive review, DC, Four Horsemen, Mattel and tagged DCUC, Flash, Green Lantern. Bookmark the permalink. What was the other DCUC you skipped?